Just saying the word sounds rude – like you’re interrupting someone without saying “excuse me”. Rude behavior can be as simple as belting out a loud burp or forgetting to open the door, as demeaning as speaking harshly, or as disrespectful as rolling our eyes when our spouse does something we don’t like or doesn’t do something we want them to. Face it. We all have moments of temptation to be rude, but we don’t have to choose to be so. We can instead “put on love”. How? By thinking and deciding before the heat is on, when the way is clear and uncluttered by our selfishness; by praying to the Lord for help in our weakness, and then…believe He will help us. Rude behavior is the outflow of a selfish heart. when your spouse calls saying they’ll be late requiring you to put the kids to bed alone – again! when your spouse falls asleep on the couch infringing on your plans and/or desires. when your spouse fails to do the one thing you asked them to do for you and you have to do it yourself! when your spouse isn’t telling the story the way you would, so you interrupt. 1 Corinthians 13 is not a hard chapter to understand, yet why do we so often fail to truly love in this way? If we knew the answer to this simple question we wouldn’t need God. He wants us to cry out to Him for help in turning our selfishness into charity; our rude behavior into kindness. So let’s practice loving our spouse by resisting the temptation to be rude, crying out to the Lord for help in our weakness and watching Him change us for His glory! 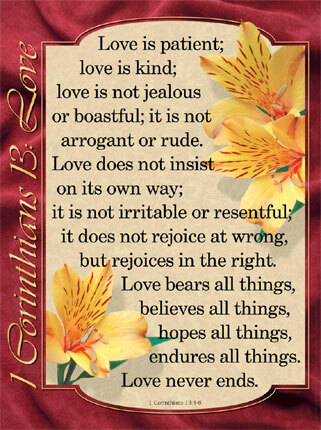 This entry was posted in Christian Marriage, Love is and tagged 1 Corinthians 13, Christianity, Insults, Lord, marriage, Religion and Spirituality, Rudeness, United States. Bookmark the permalink. Debi, thank you for reminding us not to be rude, especially in the little ways that we think we deserve to be unkind because someone else did not meet our expectations. I so often think of Jesus and how His example is never one of rudeness even though He bore the greatest insult of all, that of bearing all our sin. I am so grateful that I am complete in Him. I appreciate your encouragement to reckon that true every day so that I walk well in Him. Janie – I am also grateful for Jesus’ willingness to bear “the great insult of all”. What a gift His unselfishness is to us every day – even when we’re rude! Amazing love! Thank you for commenting – have a great day! Wow Debi! This post could not have come at a better time. My behavior has been oozing rudeness this week! I could not put my finger on why I was acting this way. This post pricked my heart, especially the part in bold, “Rude behavior is the outflow of a selfish heart.” That spoke volumes, as if the Still-Small-Voice inside of me spoke it Himself. Thank you so much for your blunt honesty in this post, it really helped me. Now, Lord, please help me in my weakness.